2 The Facilities In Bandros-Bus. Bandros-Bus is a double-decker bus in the city of Bandung, which is provided by the government of Bandung for tourists who want to get around the city of Bandung. inaugurated by the Mayor of Bandung Ridwan Kamil coincide with New Year’s Eve, 2014. The tour bus is serving the tourists in the city, Bandros-Bus also a form of Corporate Social Responsibility of the Company in cooperation with city government. 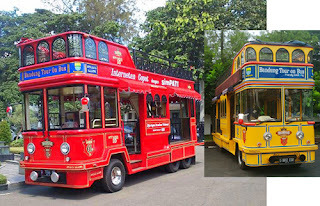 The tour bus has a capacity of approximately 30 people is maximized on the second floor, while the first floor there are only 6 stools, benches, and there is a balcony outside which can be used for stand tourists. are designed with a comfortable and attractive, is expected to reduce private car use so that it can reduce traffic congestion that occurred in the city of Bandung. Previously, to naming names its own bus, the city government also held an open contest to name the tour bus through social network Twitter. The competition was won by Erry Pamungkas, who gave the name of this tour bus with bandros name, the abbreviation of Bandung Tour on The Bus. One of the facilities provided in the bus is a GPS device so that travelers know where his position was. In addition to GPS, the bus is also equipped with a data center and information making it easier for travelers to access the inside and outs of the city of Bandung. Physically, bandros has a length of 747 cm and 315 cm high and 210 cm wide. At lower levels, there are a number of seats and chairs round long with a capacity of 12 people and able to carry 20 passengers to stand while on the upper level, available 24-seat passenger. The driver and the conductor bandros dressed with a special design that makes tourists more interested in using these buses. Operates every day except Friday 1 day up to 8 round/day from 08.00. 1 trip = 60-90 minutes (depending on the situation). 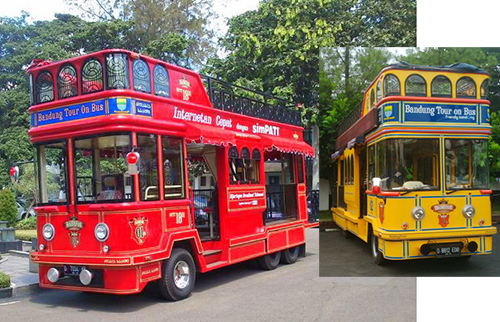 As of January 3, 2015, ticket booth and bus stop bandros moved to Bandung Square (in front of City Hall Building). Passengers up and down in the Square (not to be down on the street). Town Square – Jalan. Banceuy – Jalan. Braga – Jalan. Lembong – Jalan. Sunda – Jalan. Banda – Jalan. Diponegoro – Jalan. Dago – Jalan. Kepatihan – town square. -Follow twitter and Instagram Bandros-Bus to get info update, query, and even complaints. -Passengers are required to make reservations in advance to the number 022-61591010 (office hours) SMS to the number 087 736 081 998, and via WhatsApp in the number 08579355911. -After dialing the numbers, passengers will get a reply from the bus operator bandros about the schedule and the number of seats that can be reserved. Rental rates for residents or tourists in groups in the range of $ 51 to $ 59.